Sister Marcia Kimball died peacefully on June 8, 2016 at Calvary Hospital, Bronx, NY. A graduate of the College of New Rochelle, she entered the Ursulines in 1952, and made her first vows in 1958. She began her ministry as a teacher at Blessed Sacrament School in New Rochelle, and she went on to teach at the Ursuline Academy, Wilmington, DE; St. Angela’s School in the Bronx; and Ursuline Academy, Bethesda, MD. In 1972, after a year of renewal in Rome, she began her work as a computer Programmer and Analyst at the Data Center for the Archdiocese of New York, and served there until 1994. She also used her computer skills for the Ursuline Provincialate and the Ursuline Community of St. Teresa. As province archivist she created a computer program for storing data in the Archives and shared this ArCat Program with other religious communities. At the same time she used her many musical talents, both choral and organ, for community religious services. In later years she gave several piano recitals for the community coupled with information about the composers and their works. 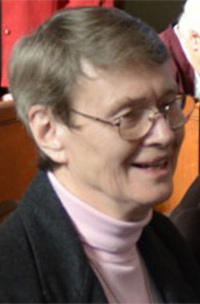 Marcia held an MM degree in Liturgical Music and an MTS in Chemistry and Physics, both from the Catholic University of America. She participated in computer workshops, served as a consultant for archivists, notably the American Conference of Associates and Religious from 2000 to 2006 and the Archive of Religious Institutions from 1998 to 2009. Marcia was born in Rahway, NJ, to Dorothy and W. Montgomery Kimball. She is survived by a sister, Carolyn Kimball Holmquist, and a niece, Kirsten Becker, both of Santa Barbara, CA. Her wake will be held at the chapel of the Province Center on Monday, June 13th from 2-5pm. The Mass of Christian Burial will also be at the Province Center 1338 North Avenue, New Rochelle, NY on Tuesday, June 14 at 11am . Burial will be at Holy Sepulchre Cemetery. In lieu of flower, gifts may be sent in her name to the Province Retirement Fund, 1338 North Avenue, New Rochelle, NY 10804.